Our Pure Caffeine Anhydrous Powder is a white powder that has a bitter taste and slight odour. 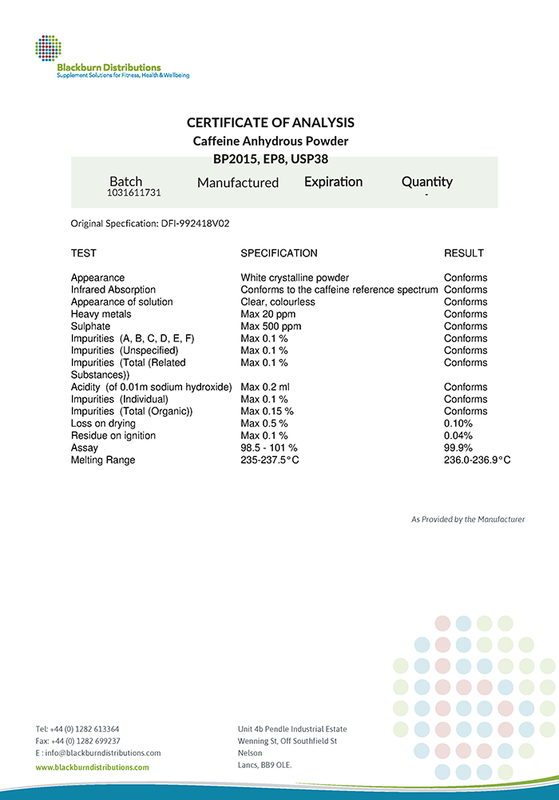 This product’s certificate of analysis is available on request. PLEASE NOTE, that excessive consumption of Caffeine Supplements can cause caffeine intoxication resulting from over stimulation of the central nervous system. This level can occur from approximately 300mg of it. Unfortunately, we are no longer able to ship CAFFEINE POWDER outside of the EU or via Express shipping (DHL) within the EU but we can still ship via DPD.We sincerely apologise for any inconvenience this may cause and for further information please Contact Us. How Powdered Caffeine can be taken by adding the recommended dose to drinks such as protein shakes, fruit juice or water, or by placing the recommended dose into empty capsules and swallowed. When Pure Caffeine Anhydrous should be taken during the day with meals. We do not recommend taking it before bed due to its stimulant effects. Dosage A moderate dosage of Pure Caffeine Powder ranges from 60mg – 300mg per day. We recommend not taking more than 600mg of it per day. Side Effects Side effects of taking Powdered Caffeine excessively or mixing this product with other stimulants could result in you becoming addicted and suffering from restlessness, rapid heartbeat, hypertension headaches, heartburn, insomnia, nausea and nervousness. Caffeine Powder is widely used in the food and drink industry to boost the alertness and stimulatory effects of the products. Energy drinks are large consumers of caffeine powder during manufacture but less well known applications include addition to protein bars, morning cereals, coffee flavored ice creams. It quite surprising how many different food stuffs contain or have added caffeine. In cosmetics and personal care products, Caffeine Powder is used in the formulation of bath products, cleansing products, makeup, shaving and skin care products. Caffeine Powder works by enhancing the appearance of dry or damaged skin by reducing flaking and restoring suppleness. I'm very pleased with the quality of the caffeine and pureness, and also with the smoothness of the buying process. I got it shipped to Sweden without an issue. First time purchasing from BlackBurn, but probably not the last time. Easy navigation, great quality product at the right price that arrived well packed and in perfect condition. I cant ask for more than that. Thankyou Blackburn Folk!! Good stuff and service, Thanks !